Now, with that being said, let me say this: I wish I would have had this book in hand years ago! With honesty, openness, humor, hope, and encouragement Kori writes to military wives, likening their military spouse-dom to being on a cheerleading squad. She exhorts that there is so much more than mere survival in this military wife role. As military wives, we stand in unquestionable support of the men we love, serving as cheerleaders in this olive drab world. We must also recognize, though, that God has more for us than standing on the sidelines of our husband’s career, waiting for the deployment to be over or our next duty station. Today, he has placed a calling on us and has a plan for our lives, regardless of location or circumstance…Come experience the adventure of military life and see what God can do with you! I’ve had this military-wife assignment for a few years, and it’s been both a joy and a challenge. I love the military’s traditions and standards–the pride–the history. I love the camaraderie of the military family and the adventure of military life. I’m challenged by the same things as others: long hours, deployments, field time, etc. But, I refuse to let negative experiences overshadow great ones. I choose to cheer on the team–my team–until God leads my husband down another path. Olive Drab Pom-Poms sports such chapters as: Part of the Game, Stunts, Bring it On!, Overtime, Cut from the Squad, Pom-Poms of a Different Color, and Touchdown! In each one, Kori paints the picture of how we, as military wives, are irreplaceable and vital not only to our husbands, but also to the unique plan God has for each of us. Overall, I was very encouraged by Kori’s words and her honest and real portrayal of the military-wife life. I wish I could give a copy to every new military wife! 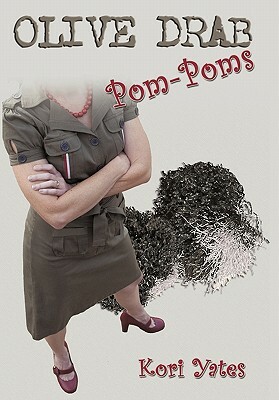 If you are, or you know, a military wife, I would recommend picking up a copy of Olive Drab Pom-Poms. The link is not an affiliate one, but it is to an online bookstore which I truly love buying books from because of their track-record of giving to good causes. Or, you can buy the book directly from Kori’s website.